Registration desk is located in front of the Great Hall (second floor). On Tuesday and Saturday, for participants who wish to safely store their luggage upon arrival or before departure you can ask the organizers or student helpers (look for ‘technical support’ accreditation). Also, for lost objects you can ask the organizers or student helpers at the registration desk. Free wireless internet is available in all areas of the University through EDUROAM network, which is accessible by registration, using your university credentials. Other network is accessible by using the password you can find noted at the Reception desk. 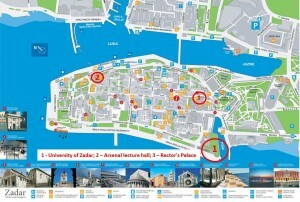 Main Conference venue (Rooms A, B, C, D, E, F, G, H, I, J and Great Hall) are at University of Zadar (Obala kralja Petra Krešimira 2, Zadar). Welcome Reception will be placed at Museum of Antic Glass (Poljana Zemaljskog odbora 1, Zadar). nvited talks from Wednesday till Friday will be placed at Arsenal (Trg Tri bunara 1, Zadar). Poster sessions will be placed at Rector’s Palace (Poljana Šime Budinića, 3, Zadar).